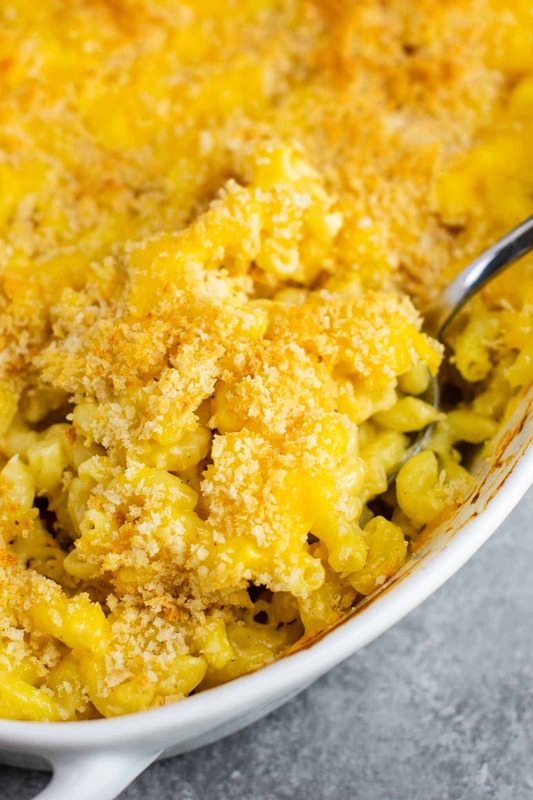 This baked macaroni and cheese recipe is pure comfort food. The classic dish, but made even easier thanks to my favorite method for how to make quick cheese sauce. This recipe is by no means healthy, but it is made with simple, real ingredients and is definitely worth indulging in for special occasions! Crosby’s favorite food is macaroni and cheese. How toddlers are born knowing it’s the good stuff I’ll never know, but he loves it! My picky eater ate an entire plate of this baked mac and cheese! It is really so simple! 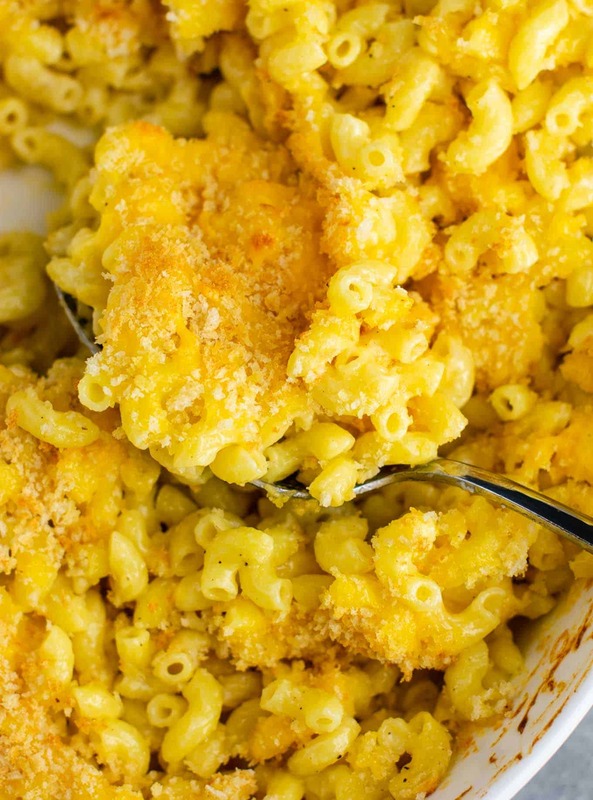 Traditional macaroni and cheese recipes call for making a roux, but I’m going a different and easier route that is just as delicious! 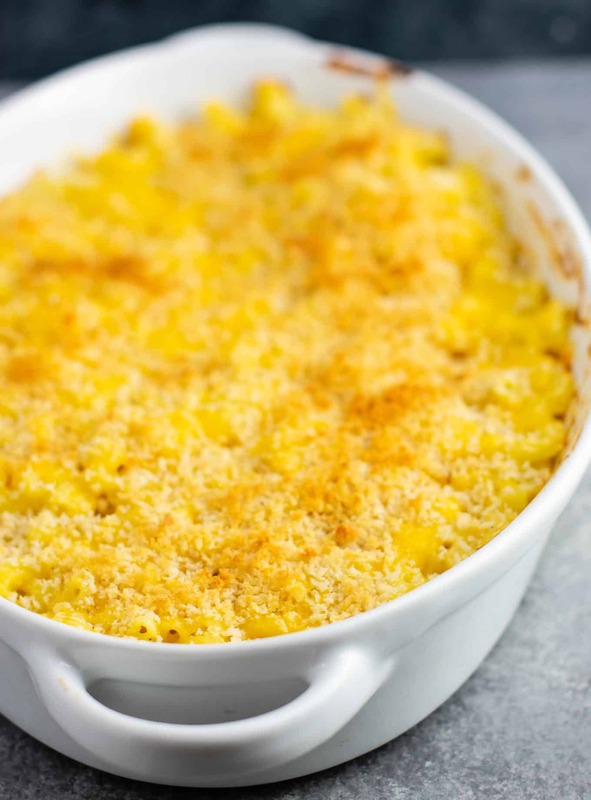 This baked mac and cheese is ready for the oven in less than 15 minutes! It really is so simple and so incredibly delicious to boot! First, start cooking your macaroni noodles. You want to cook them to al dente, and no longer. This will ensure that you don’t get mushy noodles once they are baked. While the noodles are cooking, start the cheese sauce. Ever since I made my easy cheddar cheese sauce, I have been hooked on this method. All you do is add your cornstarch, milk, and cheese to a sauce pan. Warm it up and whisk until thick and cheesy. It’s really that simple, and foolproof too! No need for a roux that requires constant supervision. Plus the sauce is ready by the time the noodles are done cooking! Once your noodles are cooked, drain them and add them to the saucepan with the cheese. Give it a good stir to combine. 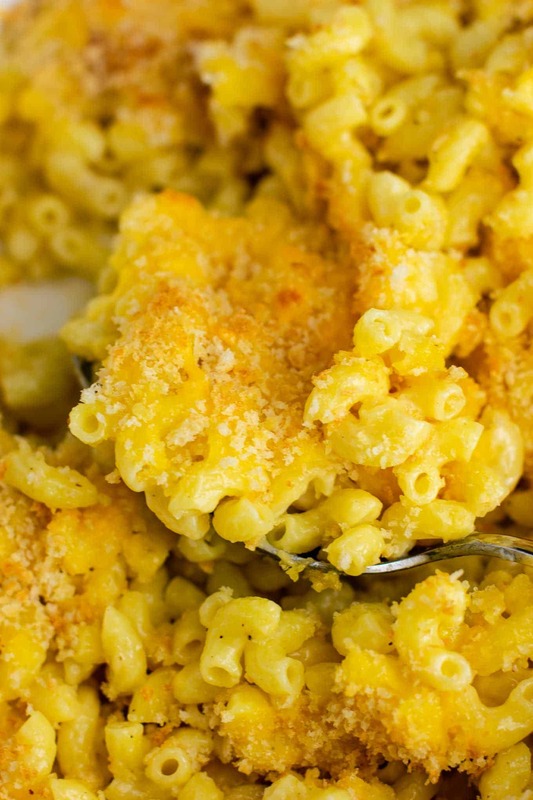 Do I have to bake my macaroni and cheese? Nope, you don’t! It’s thick, creamy, and tantalizing even if you don’t bake it. 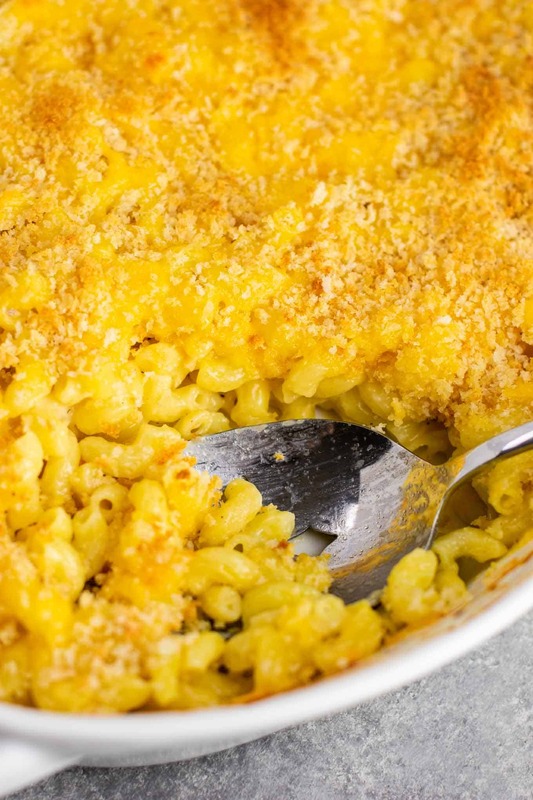 If you don’t want to bake your mac and cheese, just stop at this step! Top with panko additional cheese and panko style bread crumbs. Bake at 400 degrees for around 15 minutes, or until the top is browned and bubbly. 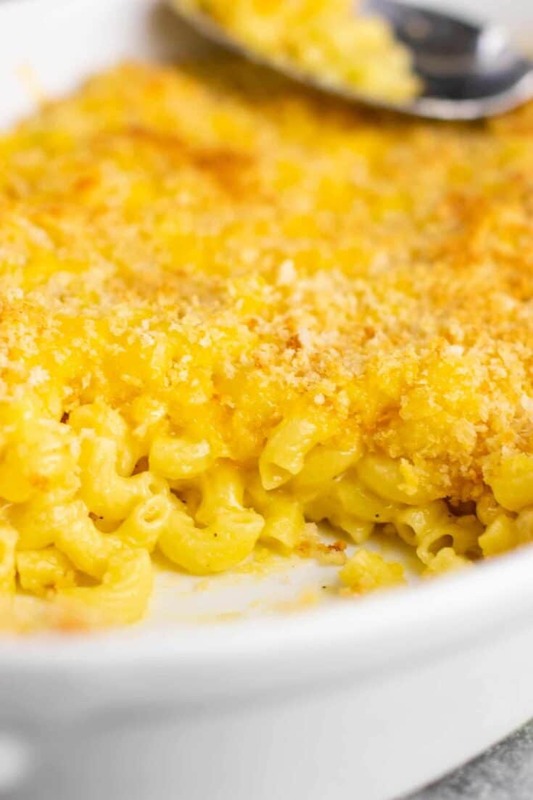 What is the best cheese to use for macaroni and cheese? 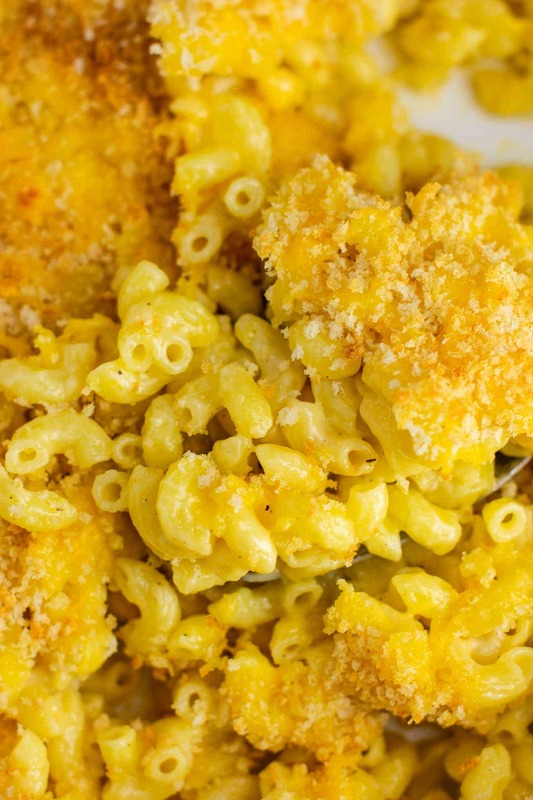 You want good quality cheese when you are making macaroni and cheese from scratch. Mozzarella is a great melty cheese, and sharp cheddar adds a great depth of flavor. What should I serve with my macaroni and cheese? A protein and a veggie and you’re ready to roll! I personally love serving my baked macaroni and cheese with black bean burgers or another veggie friendly protein. Follow along on facebook, instagram, and pinterest for all the latest recipes! 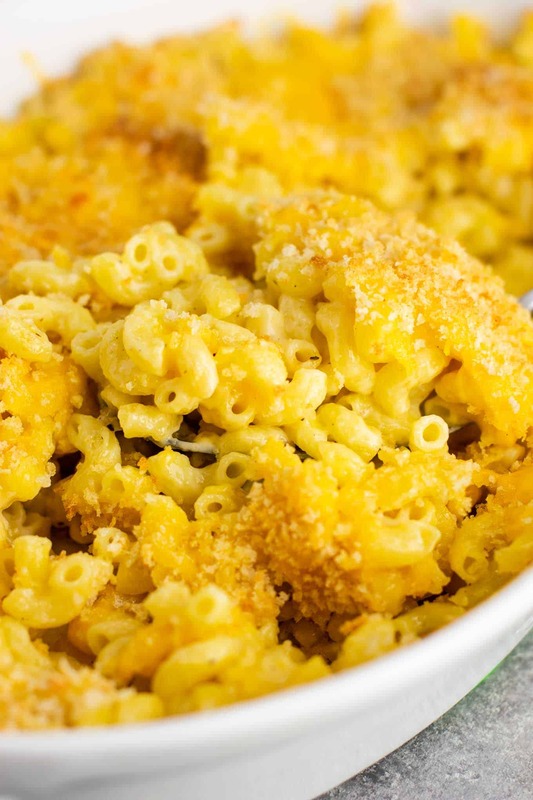 This baked mac and cheese recipe is a classic favorite comfort food! So good! Reminded me of the mac and cheese my grandma used to make!